We Have Always Lived in the Castle by Shirley Jackson is one of the creepiest stories I have read in a long time. This is my first read for the R.I.P. XII event. I'm alone in the house writing this review, and writing this review is scaring me. Yes, it's that kind of book. The book begins with a creepy mansion at the edge of town. It's the Blackwood House and it is inhabited by two sisters and their deranged uncle. The Blackwood sisters, Merricat and Connie, have a secret. Six years before the events of the story, the Blackwood family sat down for dinner one night and died of arsenic poisoning. Not only did Connie survive the incident, but waited till everyone was dead, cleaned the utensils, called the police and confessed to the crime. Her younger sister Merricat, who had been punished and sent to her room, also survived, as did Uncle Julian, who lost his mind. Six years later, Connie has been acquitted of the crime, but refuses to leave the Blackwood House for fear of the townsfolk. The town always hated the Blackwoods for their wealth before, and now wish the sisters would just vacate. Merricat goes to the town to buy groceries every week and gets teased all the way back. They shout at her, point and laugh, even as she thinks of all the ways she would make them shut up, if she could. My name is Mary Katherine Blackwood. I am eighteen years old, and I live with my sister Constance. I have often thought that with any luck at all I could have been born a werewolf, because the two middle fingers on both my hands are the same length, but I have had to be content with what I had. I dislike washing myself, and dogs, and noise. I like my sister Constance, and Richard Plantagenet, and Amanita phalloides, the deathcup mushroom… Everyone else in my family is dead. This is how the book begins. It seems as though the loss of their family has affected both the sisters quite differently. While in Connie's case, the result is complete forced seclusion from people, Merricat, who seems otherwise normal, has a stunted growth. Extreme superstitions keep her from doing the most basic things, like cooking and gardening. She is fiercely protective of her sister Connie and still thinks like the twelve-year-old she was when her family died. The story takes an unexpected turn when a cousin arrives, Charles Blackwood, who promises to show Connie the outside world, and threatens to interrupt Merricat's neatly arranged life. Little by little, she reveals the mystery surrounding the deaths. The writing is richly atmospheric, very true to the gothic style. There is a lot going on in the story, it is strewn with details which demand attention, analysis, interpretation; the language then is a distraction, but what a beautiful one. It plays with your senses and the imagery alone can send shivers down your spine. I had to read sections of the book again to fully grasp what was going on, sections which seemed like intriguing descriptions until a reread revealed them to hold so much more. What adds to the gothic aura of the novella is the recurring theme of loneliness, fear of being outcast, the exclusion from the normal, the small-minded Salem-trial-like persecution of those who are "different." The story makes you wonder, what came first - the fear or the monster? The book is about a madness that stems out of shared trauma. There is a very feminine, possessive, almost motherly quality to the sisters' insanity. The two "get" each other, it's almost as if they are two faces of the same person. The bond shared by Merricat and Connie is unnatural for their age, but very sisterly and impossible to break. Charles Blackwood almost manages to get between the sisters, but even he can never take Merricat's place in Connie's heart. Together they make a deadly pair, each supporting and aggravating the others' faults; until you can't tell apart victim from perpetrator. 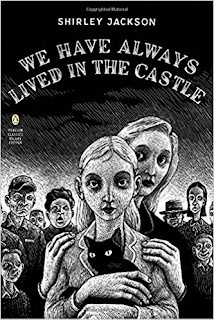 We Have Always Lived in the Castle by Shirley Jackson is like a ghost story turned inside out. Think of a conventional haunted house. Two kids venture into the grounds, a test of their wits, and encounter unspeakable horrors. We learn the history of the house in flashback. This book does the exact opposite. It completely dismantles your standard introduction-action-climax-resolution structure. The book ends on its climax, that highest most intense point in the story, whereas the resolution has already happened somewhere in the beginning... the "who" done it is one of the first things you discover. It's hard to explain, but amazing to experience. The ending is quite satisfactory, with neither twist nor cliffhanger, yet you read the last line and realize, the story has just begun.